After more than a year of planning, Vermont Works for Women in partnership with Salvation Farms is excited to announce a new skills based, hands-on training program called Step In to Work / Vermont Commodities Program (SITW/VCP). At VWW, our SITW work readiness program empowers women to recognize their potential and explore, pursue and excel in work that leads to economic independence. Complementary, the VCP program at Salvation Farms teaches transferable skills and encourages participants to explore job opportunities within the Vermont food and manufacturing industries. By combining the professional skills curriculum, wrap-around support, and employment services of SITW with the targeted food handling and processing training of VCP, this partnership will empower women to develop self-confidence and cultivate self-worth for a better future. 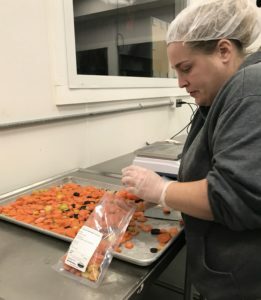 Food manufacturing is one of the few industries experience growth in Vermont, and provides a diversity of new opportunities for our participants. For women who have experienced trauma or low self-esteem, working in this industry can boost confidence and provide a sense of contributing to goals larger than themselves. Employers in the food industry tend to be more flexible in hiring and scheduling than other sectors, and willing to support employees in problem solving in order to reduce costly turnover, build connections, and grow a reliable workforce. 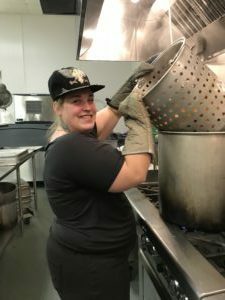 The women who complete SITW/VCP will be prepared to find successful employment in an industry, which offers good wages and benefits; and, most importantly, find consistency and stability in their personal and professional lives. Women interested in learning more about this unique opportunity should contact Heather Newcomb by phone at 802-655-8900 or email at hnewcomb@vtworksforwomen.org.